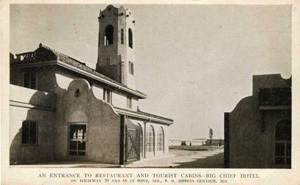 Originally called the Big Chief Hotel, the Big Chief Dakota Grill is distinctive for its Spanish Mission Revival styling. Two stories tall, its white stucco walls, terra-cotta tile roofing, exposed rafter ends, and arcaded front porte cochere are unusual in Wildwood, Missouri. The only original feature missing is a prominent false bell tower that rose from one corner, which was removed during the 1950s. Otherwise, the Big Chief looks and operates much as it did when Route 66 passed by the front door. One key to the success of the Big Chief was pavement. The section of Route 66 through Pond, once the name of this section of Wildwood, was one of the earlier parts of the Federal highway to be paved. After its commissioning in 1926, Route 66 had sections that remained dirt for years. It was upwards of 10 years before travelers could drive from Chicago to Los Angeles on pavement. The road through Pond, by contrast, was paved all the way to St. Louis by 1924. With pavement came cars. In 1913, Americans owned 1.2 million cars; by 1925 that number had jumped to 19 million. Individual mobility reached a level never possible before, and automobile tourism grew nearly as fast as did the rate of automobile ownership. When autos first began crossing America on Federal highways, drivers tended to camp by the roadside on their own or to stay in tourists camps. There were few hotels except in major cities. Built and opened in 1928 as the Big Chief Hotel, the complex wasn’t really a hotel at all—at least not as we think of hotels today--but a solution for the traveler weary of camping out. The Big Chief was actually a tourist cabin court, sometimes called a “cabin hotel”--at the time the latest thing in roadside lodging. The Big Chief was unusual in three ways: It was one of the earliest cabin courts in Missouri, it offered full service dining, and it was one of the largest cabin courts. In 1935, a guide to Missouri listed only nine courts with more than 30 cabins. The Big Chief had 62, each with its own garage. Advertisements from the period boasted that the Big Chief cabins had both hot and cold running shower baths. Small individual cabins had a strong appeal for families traveling together, and the Big Chief was primarily a family destination. The property featured a large playground. One could spend the night for a dollar and 50 cents, buy a 75-cent steak dinner, a 40-cent special plate lunch, or a 5-cent sandwich. The front porte cochere served as a Conoco gas station, and customers could also buy groceries. In the evenings, dining room tables were pushed aside to allow for dancing. Bar service was added when Prohibition ended in 1933. By then, the transcontinental Mother Road had been rerouted over more southerly highways, but the Big Chief remained popular as a local destination, sponsoring a series of fall dances and attracting conferences and meetings. The Big Chief survived the lean years of World War II by furnishing housing for employees of the nearby Weldon Spring Ordinance Works. That change to longer term housing continued after the war, when the cabins were rented to workers at a Weldon Spring uranium processing plant. By 1949, the restaurant had closed. Over the years the rented cabins fell into disrepair and were demolished. The restaurant building, however, survived, and in the early 1990s was restored and returned to its original function as a restaurant. Listed in the National Register of Historic Places in 2003, the Big Chief is one of the few surviving full-service restaurants left on Missouri Route 66 and provides a feel for roadside stops during the 1930s. 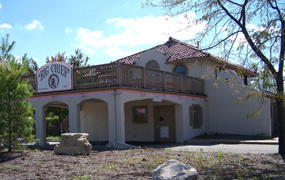 The Big Chief Restaurant building, now occupied by the Big Chief Roadhouse, is at 17352 Old Manchester Rd. in Wildwood, MO. The restaurant is open Monday 4:00pm to 10:00pm, Tuesday-Friday 11:00am to 11:00pm, and Saturday and Sunday 7:00am to 11:00pm, and is wheelchair accessible. Call 636-458-3200 for information or visit (call to get new website address in early Dec.) The National Register nomination form for the building can be found here.